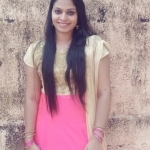 Revathy Raveendran from Thiruvananthapuram, B.Com Graduate. GOOD ANALYTICAL SKI.. GOOD AT DECISION MA.. FAST LEARNING HARD WORKING WILLIN.. GOOD LISTENING AND O..
are one of expert skill area's of Revathy Raveendran . Revathy Raveendran is working in Human Resources industry.